Anyone who knows me just a little bit knows that I have a bit of an obsession with ceviche. The great thing for me is the explosion of flavors you get. If you’re cooking fish, you have to treat it delicately, for the most part. Too much of anything, and you end up with…anything except fish. 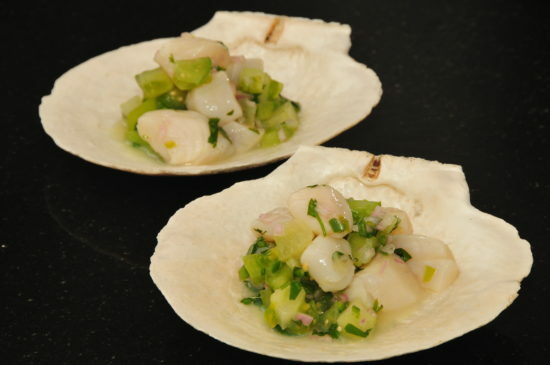 But ceviche…Ceviche lets you create explosions of flavor, while still maintaining the deliciousness of the protein. Case in point: scallops. A NOTE ON SCALLOPS. You can get dry or wet scallops. Wet scallops have chemicals added to make them pretty in the display case. They taste like metal. Dry scallops have color variations, and are tasty. If the store you’re buying from doesn’t know the difference, assume the worst and go elsewhere. Throw it in a non-reactive bowl and refrigerate about 6 hours, stirring every 2 hours. Serve with vihno verde. Yep, it’s that simple…and simply delicious!